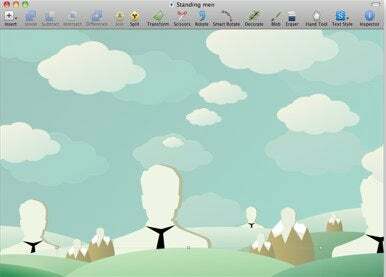 There’s no shortage of vector drawing apps on the market today, but Bohemian Coding’s Sketch stands out from the crowd by combining a minimalist, Mac-like interface with numerous vector design tools and a drawing space that has both an unlimited size and number of layers. Vector graphics have become popular with graphic designers and artists because, unlike standard bit-mapped graphics, they don’t lose any resolution when scaled up. In addition, since vector graphics describe shapes rather than pixels, they produce exceptionally smooth curves and edges. Sketch offers a number of powerful tools to manipulate vectors, and features three different drawing tools: pen, pencil, and brush. It also features ten pre-defined, editable shapes, a host of object modification tools—including precise Boolean operations, join and split, scissors, and smart rotate—and the ability to create user-defined shapes. Rulers, grids, and alignment tools are also available, as well as fully customizable radial and linear gradients. In order to keep Sketch’s interface as minimalist as possible, tools and modifiers are accessed as needed from drop-down graphical menus in a user-configurable toolbar, rather than being ever-present as they are in most drawing apps. To help new users settle into its unique interface, Sketch provides helpful pop-up windows and messages that open and close automatically as you explore its various tools and functions. Sketch can import most common image file types, including JPG, TIFF, PNG, and GIF, and can export in PDF, SVG, EPS, JPG, PNG, and more. It can also be used in conjunction with Bohemian Coding’s bit-mapped graphics editor, DrawIt for OS X, as well as the SketchPad app for iPad. Sketch is available now for $55 and runs on OS X 10.6 or later; you can download a 15-day free trial.